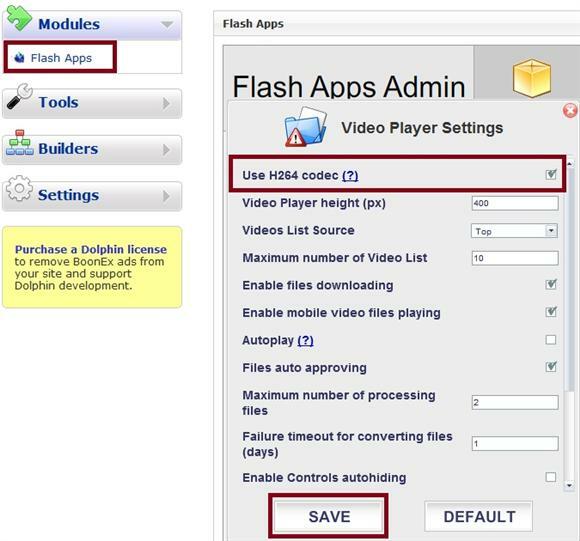 Recently I did some video upload tests with and without the h264 codec, which you can enable and disable in your Dolphin Administration "Flash Apps" Modules area in the "Video Player Settings". You can read up on the H.264/MPEG-4 AVC codec over at Wikipedia if you are interested in more details about how it works. 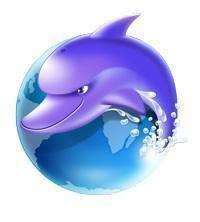 It is pretty easy to enable and disable in Dolphin Administration. As you can see all you need to do is check or un-check the box that says: "Use H264 codec", and save the changes. After making changes, I usually clear the Dolphin cache just to make sure the changes update. If you have the h264 codec enabled and you get a lot of video uploads that fail disable it and try again. You are more likely to have videos fail when using it. The h264 codec seems to be more particular and sensitive to what the input format should be compared to not using it. With h264 enabled your output video will be .m4v. Without it your output video will be .flv. Generally a successful h264 (.m4v) conversion in Dolphin will result in a much smaller file size, which saves hosting space and bandwidth. After converting the same video to both .m4v and .flv format I couldn't see any difference in quality. Video was made with Windows Movie Maker Live. The quality is nearly the same (actually I can't tell the difference). The h264 codec results in a much smaller video size 3.10 MB (.m4v) compared to 21.5 MB (.flv). The drawbacks are that it takes longer to convert using h264 and it uses quite a bit more memory (RAM) to process it. This could lead to problems with resource usage with a lot of shared hosting accounts. Another thing is that the h264 codec seems to be more particular about the input video, meaning it is much more likely to fail when compared to .flv format. FLV format has a much higher success rate, at least in Boonex Dolphin. It also uses less ram, and it doesn't take nearly as long to convert. The drawback is that it will usually result in a much larger file size. The h264 will get you smaller file size videos, but use more memory resources that take longer to convert. They are also more likely to fail. Flv has a higher success rate, and uses less memory and resources, but they usually result in larger file sizes. You could reduce the ffmpeg bitrate code in Dolphin to see if you can get a smaller file size output for .flv videos without losing quality.